Yes, food freedom is real. The term has become increasingly popular: you may have heard it around the dinner table, at farmers markets, or even at a food freedom fest. This catchphrase of locavore culture has become so common that, until recently, you may have thought it to be a real thing. Proponents of food freedom have talked about it as a future ideal, yet we’ve only seen multiple attempts fail. Until now. In March, the food freedom movement took a giant leap forward when the Wyoming Food Freedom Act was successfully passed. This new law allows Wyoming residents to make and sell almost any kind of food, without any kind of governmental regulation. Many health departments around the nation would shudder to hear that homemade food items like chicken pot pies are completely unregulated in Wyoming. The one caveat: the food must be made at a home and consumed at a home. That might seem limiting, but hey, it’s progress… after all, this kind of freedom doesn’t exist in the other 49 states. And now, Maine is making great strides toward food freedom with their Right to Food amendment, which would literally alter their state constitution to include the choice of food as an unalienable right for their citizens. These efforts are well-summarized in this compelling testimony by Joel Salatin (seriously, it’s excellent — read it now). If Maine does succeed in passing this bill, we have to start wondering, how many other states will follow? We already know that Virginia has been getting closer each year. 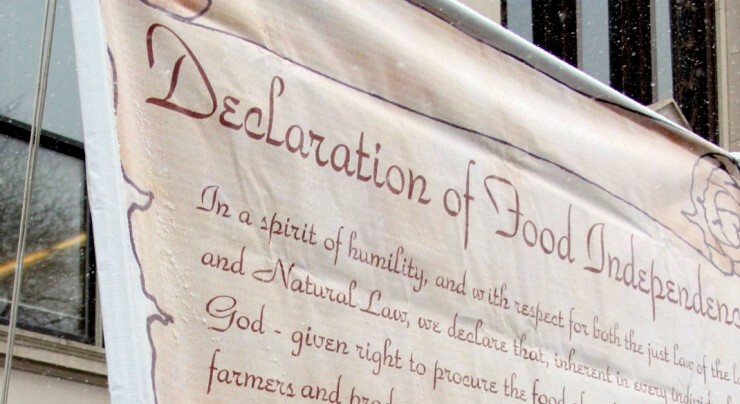 Even with this major advance, food freedom is still a relative term. Wyoming’s landmark law doesn’t allow products containing most kinds of meat, which must be processed in a USDA-inspected facility. Nor does it allow interstate sales, so this “free” food is currently locked up in Wyoming homes. The truth is that Wyomingites will still be consuming a lot of food that has plenty of regulation behind it. However, the Wyoming Food Freedom Act does prove that it’s possible to completely remove the government’s grip on some types of food sales. It proves that there is demand for this freedom, and with enough persistence (Wyoming’s been trying for six years), food freedom is an attainable goal. When Forrager started a few years ago, only about half of the states had cottage food laws. Today, nearly all states allow some type of homemade food sales, so the question is, what’s next? Now we know the answer. Food freedom is a real thing, and this trend isn’t going away. The time is ripe for this movement to grow.